Unattributed photo from author's website. The Trickster’s Hat is a 208 page hardcover, full color, workshop book that amongst other things contains 49 exercises designed to help experienced and inexperienced writers, artists, teachers and wide-eyed wonderers go deeper within themselves, expand their imaginations and break creative blocks. It’s not a 'how to do,' or a 'how to be' kinda book, it’s a mischievous companion that will hopefully stay nestling in your pocket for years to come. Come prepared with curiosity, and some great questions, to ask Bantock, the author of the reknowned Griffin and Sabine series. 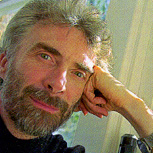 Nick Bantock has authored 26 books, 11 of which have appeared on the best seller lists, including 3 books on the New York Times top ten at one time. Best known for Griffin and Sabine, which stayed on that list for more than two years, his books have been translated into 13 languages and more than 5 million have been sold worldwide. Once named by the classic SF magazine Weird Tales as one of the best 85 storytellers of the century, for 20 years Bantock has spoken and read to audiences throughout North America, Europe and Australia. His new book The Trickster's Hat is based on his workshop teaching. His paintings, drawings, sculptures, and collages have been exhibited in shows in UK, France and North America and are in private collections throughout the world. In 2010 he had a major retrospective exhibition at the MOA in Denver. Nick has a lifetime BAFTA (British Oscar) for CD Rom Ceremony of Innocence, created with Peter Gabriel’s Real World. He has two iPad apps, Sage and The Venetian. Griffin and Sabine was recently optioned as a movie. Nick was born in England. He went to school in the soulless suburbs of North East London, and from there he moved on to art college in the market town of Maidstone, Kent. At the age of 23, he give up his job in a betting shop and began working as a freelance illustrator. Over the next 16 years, he produced approximately 300 book covers, including novels by Philip Roth and John Updike. During the winter of 1988, he moved to Vancouver with his wife and young son. Two years later, he decided to try his hand at creating pop-up books, and the legend "Griffin and Sabine" was born. Nick Bantock's book Dubious Documents is currently available from LibraryThing Early Reviewers. Nick Bantock's book Pharos Gate was available from LibraryThing Early Reviewers. Nick Bantock's book Griffin and Sabine 25th Anniversary Edition was available from LibraryThing Early Reviewers. Nick Bantock's book The Canterbury Tales was available from LibraryThing Early Reviewers. Nick Bantock is currently considered a "single author." If one or more works are by a distinct, homonymous authors, go ahead and split the author. Nick Bantock is composed of 6 names. You can examine and separate out names.